Michael Dunlop is releasing a book. Out on the 20th April. If it's as outspoken as he is it'll be a lot more interesting than your average sports autobiography. John McGuinness also releasing one a couple of weeks later. Gaz, Mick D, moto vudu and 1 others like this. Some snippets from his book on seeing his dads death on screen during a preview for Road, on Darren Burns the rider who collided with Robert after he fell, what he thinks of Guy Martin, his fallout with William and his win in the newcomers race at the Manx Grand Prix as a 17 year old in 2006. In 2014 there was a documentary made of my dad, Joey, William and me called Road. It's a cracking film. We contributed to it. I was followed for a year with cameras. I took time off work, gave up pay to do interviews. I'd never say, 'Don't watch it.' But I don't think the producers played us with a straight bat. When it was finished, William and I went over to Coleraine for a private screening. I was looking forward to it. I thought the footage they found about Joey was really moving. Then the story moves on to my dad and I start twitching in my seat because it's uncomfortable seeing him up there. It was just wrong. He should have been sitting with us watching it. I knew they were going to cover the accident because I'd been interviewed about it. What I didn't know was that they were going to show it. This was 2014. I'd gone eight years without ever seeing the moment that took my dad's life. And there it was 15ft high on a f***ing cinema screen. Call me naïve but I didn't expect it. They showed the air helicopter camera tracking my dad and we just assumed they would get to the crucial point and it would stop. There was big swelling music going on and we expected boom, then the screen would go black. But they showed the accident and then it went off. I was poleaxed. I was furious. You know, I don't mind that they included it. If they think that's what's going to make a better film, that's up to them. They're the experts. You know, we could have prepared ourselves or even left the room. William was just as knocked out as me. But then he says, 'What about Mum and Nan?' 'Oh f**k, they saw the film this morning.' And they hadn't been warned either. The truth has a funny way of coming out. The rumour mill after Dad's accident said a dozen things. Dad had accidentally hit his brake button at top speed and gone over the handlebars. The front wheel had locked. The pistons had seized. There'd been an engine malfunction. Further down the line there was an inquest. All these boys gave evidence about Dad not being happy with the way the bike had been performing; he'd come into the pits just before the accident to try to get it sorted. And then the coroner concluded it was Dad's fault for hitting the brake. In those days and months afterwards you want to lash out at someone. There was another person involved in the accident. Dad had just overtaken Darren Burns when he came off. Darren had no time to react, no time at all. He smashed into Dad and seriously damaged himself. In my darker moments I think, Why was he there? What was he doing? But he was racing. Someone like my dad comes past, you probably want to be as close as you can to get a half-decent lap. And the truth is, it could have been anyone. If William hadn't stopped at University Corner, maybe he'd be the one behind Dad. You just don't know. He can't be blamed but I'm grieving and I need a target. To this day I have never spoken to Darren about it because I might get angry. I don't trust myself not to and that's sad. He's a funny lad, is Guy. He started getting a wee bit of TV fame in 2009. Some cameras followed him around the TT and he'd been a natural on the screen, fair play to him. He'd go on to become a household name for his programmes about boats and speed and stuff. But here's the thing. You mention the TT to non-racing fans and they think of Guy Martin. He's become the face of it because he's the one on TV all the time and people know of his association with the bikes. But how many TT trophies has he won? Lots of people have one or two and you never hear of them. The big hitters like Mike Hailwood, with 14, or the boys with eight, nine or 10 - you'd know their names. But lower down, there are people who you never hear of who've won four or five TT races - which is a real achievement, believe you me - yet you do hear of Guy Martin, who's won precisely none. For someone who's not a particularly successful TT racer - who is good without being great - he seems to have done very well as a TT racer, if you know what I mean. His fame from elsewhere means people assume he's had more success than he's actually had. Don't get me wrong, he's a decent racer. He's beaten me enough times and he's paid his dues. There've been enough bones broken in his body to settle that score. And before he became Mr Speed you could have a real good conversation with Guy, one to one, no bother. He's into his cars, his engines, that sort of thing - basically the sort of crap I like to talk about. V8s and V12s, we chew the fat on all that and the hours fly by. I have a real good time with him. We're a couple of men, we're equals, we've both been through the wringer. But as soon as there's a sniff of an audience he changes. That's why he's a natural for the screen, I suppose. He starts pulling facts and stories out and playing to the gallery. Every person listening magnifies his bravado to the power of 15. He's a nightmare for that at press conferences. Guy's made a few bob, though. I'll give him that. So I guess it works. It was wet and I was struggling. Me and the bike were like dance partners that had never met. We're both trying to lead. I got a terrible start and after that it was about trying to stay facing the right way as much as reel in the boys ahead of me. As we went on and with a few miles under my belt, I got a bit of a feel for the BMW and, before long, it was just William ahead of me. Going into Metropole on the last lap I thought, Coming, ready or not… and I got myself past him and into the lead. In my head this was it, game over. Nobody told William that. We're that close the rest of the lap the crowds are going nuts. Along the Coast Road we're in formation like the Red Arrows. I still think I've got it in my pocket when we get up the top to the chicane and he goes past. It doesn't matter. We're on Juniper Hill and I spy a chance. A small one. There's a wee gap up the inside so I go for it. And William slams the door. Now, I've done that move to enough people, but not my brother. By the time we finished my blood was boiling and when I saw him in parc fermé I let my frustrations out. 'I would never have done that to you,' I say. I instantly regretted it. In my own mind I've made this grand gesture to come back to racing, I'm expecting red-carpet performances from myself and it hasn't worked out like that. William's won and he thoroughly deserved his first international success, but it wasn't part of the script. Not my script. But the second the words left my lips I knew I was out of order. Obviously when he came across me he'd had no idea I was there. I know that now. I knew it then. But I still said what I said. Genuinely, deep down, I was happy for him, I still am; he earned it. I was just cross with myself, I was looking for someone to blame for my failure and I took it out on him. But I never told William that. His drawbridge went up. He saw a side of me he didn't like, a side he didn't know, maybe didn't trust, and that ruined the rest of the meeting between us. I wish I could take it back. He's my brother and I'd do anything for him. But actually it was a long, long time after that before we got ourselves back on track. Thankfully everything is fine now but it goes to show how one stupid remark can cause damage and pain. There's no big frantic start like in a wheel-to-wheel race. At the Manx everyone goes on their own, 10 seconds apart. One after one after one … The process is relentless. Every 10 seconds another lad goes off. It's like a human centipede getting longer and longer. My group was the fifth wave. I would go out 440 seconds after the first lad. It doesn't sound long but it felt like for ever. I wish I could say that all the anxiety, all the palpitations I'd had on the grid, just washed away and some calm, serene driving God took over the bike. But that did not happen. Those final 10 seconds, I was so excited to get up the road and ride hard that my head was full. I don't know what of, but it was just full. The anticipation was killing me - and nearly the bike. When the tap on my shoulder came, I nearly ripped the clutch out to get off the line. I tell you now, that release when you finally pull away is overwhelming. Mind-blowing. The thing I'd most dreamed of, of racing the Mountain Course, was right at my fingertips, and I couldn't tell up from down. I felt something click. Like a flame on a cooker being turned off. And suddenly I could see everything. The emotions were gone. Reality was giving me a kicking. My head for just about the first time that day was clear. I know what I have to do. I wasn't there just to have a bit of fun. I wasn't tearing down Bray Hill, Braddan Bridge and Union Mills because I wanted to see the scenery. I was there to win a race. Plain and simple. There was nothing else in my head. To win the race I just had to beat my class. I'd been quickest in practice; it should pose no real problem. But in time trials you never really know what the boys behind are doing. So I did the only thing I could and drove the wheels off that bike. I brushed every hedge, pushed harder and harder, and when I started to close up on the group in front I took no prisoners. The way I saw it, those boys were on more powerful machines. They should not be letting a 125 get anywhere near them. They deserved what they got. For all my ego, I knew that my engine could not compete with the 250s and 400s in a straight line. So the straights were out. But when those boys lifted for the corners, I didn't. I just said, 'I'm coming through. Like it or not.' Even leading the race, even having so much to lose, if you change the way you drive, if you start second-guessing yourself, that's when mistakes happen. I threw that bike through gaps that didn't exist. I swear, some of those boys' overalls were browner on the inside than the outside. I was the youngest ever winner, obviously. That added a few degrees of extra pleasure. I hadn't done it alone, mind. Getting me there, getting me a bike that was half-decent, getting me not chucked out of the meeting, had all come from my family. Speaking of which, William was over the moon. Ronnie was like a dog with a bone. And my dad? Well, my dad was my dad. He came over, looked me in the eye just like he did at the start, and shook my hand. He never said a word. He didn't need to. We both knew what it meant to each of us. He couldn't have been prouder. And I couldn't have been more relieved not to have tarnished the family's reputation. Gaz, #22, JPSLotus and 3 others like this. Thanks for posting, sounds like it'll be a great read. Little interview from him, the bit in bold made me chuckle. Michael Dunlop says he is intensely proud to be one of the last ‘old school racers’ who has honed his skills on the Irish roads and conquered the Isle of Man TT. 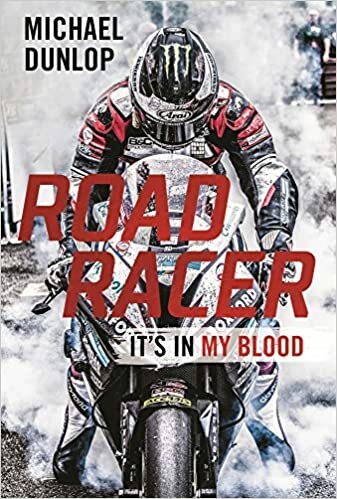 The 27-year-old, whose new autobiography Road Racer: It’s In My Blood is due to be published on April 20, has won 13 times at the TT to uphold the legendary Dunlop dynasty. His uncle Joey remains the most successful rider ever to have graced the Mountain Course with 26 victories, while his father Robert won five times to ensure the Dunlop name will be forever inextricably associated with the world famous motorcycling marvel in the middle of the Irish Sea. Sadly, both are no longer with us after suffering fatal accidents in 2000 and 2008 respectively, but Michael and his older brother William have ensured the Dunlop name burns as brightly as ever. Having learned his trade on the narrow country roads of Northern Ireland as opposed to climbing the British championship ranks, outright TT lap record holder Dunlop says victory at the major international road races tastes all the sweeter as he follows in the wheel tracks of Joey and Robert. “I’m one of the real old school like Joey and my dad who came to the TT not having done world championship short circuits; who came from the road races back home where we get five laps in practice,” he said. “Don’t get me wrong, some of the roads are fantastic, but some are awful and you wouldn’t herd sheep down them. “But I’m proud to be that person because you look down the entry list now of the boys who are winning races and they’ve either got a full-time British championship ride or have won British championships. I’m just a big, fat road racer who goes and wins races and spanks them,” Dunlop added. WTF is a brake button? Is this an Irish way of saying brake lever? I never knew the cause of the crash. Hard to picture an experienced rider accidentally pulling the brake lever at top speed hard enough to go over the bars. Thumb brake because of inabilty to use the foot operated rear brake. A bit like Doohan and Hutchinson. Keshav and BEK like this. Will have to correct myself there, basically Robert had a thumb operated FRONT brake because of injuries to his hand in the past. According to Amazon mine should be here today, seems it was released on thursday.